Human Resources Solution is a Qlik Data Discovery solution based on organizational KPIs that offers information related to payroll results (salaries, contributions, and payments), company structure, workforce evolution, turnover and absence rates among other important HR indicators. Human Resources Business Intelligence has been developed as a specific HR solution that enables hotel management to assess the effectivity of their HR strategy through the analysis of data collected from a variety of HR software applications. It enables to extract information automatically from the main databases available in the market, such as SAP, Meta4, Grupo Castilla, etc. The Business Intelligence presents summarized organizational results as well as detailed information in a simple, robust and flexible manner. This tool provides the organization with extremely valuable information that is increasingly being gathered through external HR consulting processes, therefore providing a great added value to any hospitality business. Optimize strategic decision making through an intuitive and robust environment that saves time and improves the information reliability. Provide reliable information at the right time to the right person. Focus client efforts on the business and not on the technology. Provide users with the ability to make their own analysis and reports significantly reducing the need for IT support. Make quick implementations with meaningful information from day one. 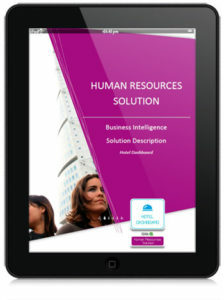 Click on above Image to download brochure on Human Resources Solution (PDF).